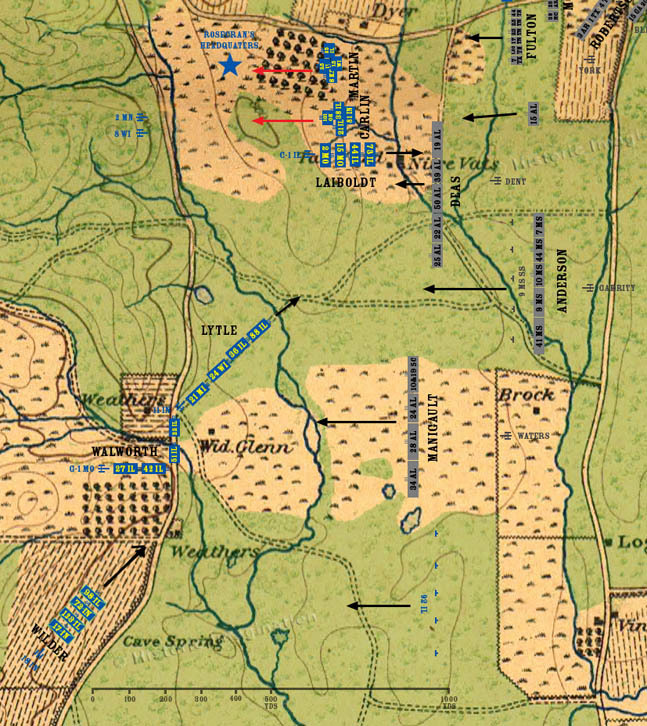 On top of the hill, the alignment of Laiboldt’s brigade is disrupted by the fleeing troops of Davis’ division. Davis implores Laiboldt to move his brigade forward to support his division and attack the Confederates. Colonel Laiboldt declines, citing the strength of his position. Major General McCook arrives and orders Laiboldt to attack. Laiboldt reluctantly orders his brigade forward. The gap between Deas and Manigault’s brigade widens. The 92nd Illinois begins to retire since Manigault’s Confederates are outflanking him to the north. Colonel Wilder gets his brigade ready to move north to meet the oncoming threat.